This year’s “Make Your Mark” campaign has seen 1,106,788 young people across the country take part, making it one of the largest youth consultations of its kind in UK history, with one in five of all young people aged 11-18 taking part. 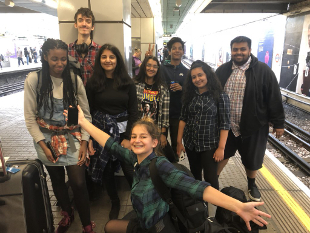 For the sixth year running, the Hounslow Youth Council have managed to better their result from the year before, managing a whopping record breaking 14,283 votes, equivalent to a turnout of more than 75 per cent of 11–18-year-olds in the borough. Councillor Tom Bruce, Cabinet Member for Education, Children and Youth Services, Hounslow Council, said: “Young people in Hounslow have worked incredibly hard to collect votes in the borough’s schools, colleges, libraries and youth groups this year and have been rewarded by finishing with the third highest turnout across the entire UK. For Ciya Vyas, a student from Lampton School, Hounslow’s Member of Youth Parliament for 2018-19, this was an extra special result as her motion to “Put an End to Knife Crime” topped the ballot both here in Hounslow and across the country and stands an excellent chance of being the UK Youth Parliament’s national campaign next year. Ciya said: “I’d like to thank all the young people who helped achieve this result and everyone who voted. “By treating youth violence as a disease, we are tackling the root of the issue, rather than mopping up the people who have fallen victim to it. The public health approach is an all-encompassing solution that utilises all our services and is the best way forward to help tackle youth violence”. Each issue will be discussed within the chamber on Friday 9 November during the UK Youth Parliament’s eighth sitting in the House of Commons. This year’s debate is due to be chaired by John Bercow MP, Speaker of the House of Commons who has chaired every debate in the House of Commons since their first sitting in 2009.